Pulmonary fibrosis is a disease of your lungs where the tissues in your lungs get damaged gradually. The condition worsens over time. This makes the lungs function less effectively causing a problem in breathing and ultimately affecting the heart and the rest of the body as well. Any such damage caused to the lung, cannot be undone. But with proper treatment, the speed of progress of the condition can be slowed down. Why Do You Get Pulmonary Fibrosis? When you get pulmonary fibrosis, the thin tissue that surrounds the lung walls and the air sacs inside them, thicken and scars. This makes the tissue harder which, in turn, makes it difficult for oxygen to pass into your blood. But what exactly triggers the initial damage cannot always be pinned. If that happens, it is called idiopathic pulmonary fibrosis. History of radiation-based treatment like chemotherapy etc. Certain medicines, while they may cure other condition, can also have an impact on your lungs at the same time. For example, chemo-medicines, heart medicines, certain antibiotics and anti-inflammatory drugs. Other lung diseases and conditions may extend and lead to pulmonary fibrosis. Some kinds of viral infections. A side-effect (or extended effect) of a gastric problem called gastroesophageal reflux disease. There is also a genetic component associated with pulmonary fibrosis. This means that if one member of your family suffers from this condition, you may also be at a higher risk of developing this problem. Your risk for the same increases with age and poor lifestyle choices, like smoking. How Do You Know If You Have Pulmonary Fibrosis? Sooner or later, everyone will face these symptoms. While some people develop these symptoms over a week, for others it may even take up to a few years. When this condition is left untreated, it can lead to severe health complications like high BP, heart failure, respiratory failure, other lung diseases etc. How Pulmonary Fibrosis Is Diagnosed? When you go to your doctor with breathing trouble, after a careful physical examination and making a note of all your symptoms, the doctor may ask you to go for a few blood tests, medical imaging, and more. Imaging tests may include X-ray scan, CT scan, echocardiogram etc. Using these tests, the doctor will be able to judge the severity of the damage and its impact on the heartbeat. There are other tests where your breath quality and strength are measured. This gives an idea of the health of your lungs. Some such tests are spirometry, oximetry, stress test etc. Along with these tests, the doctor might suggest some other tests to rule out the possibilities of other lung diseases like a biopsy. How Pulmonary Fibrosis Is Treated? LIke mentioned before, the damages caused in pulmonary fibrosis cannot be reversed. With proper treatment, only the progression of the disease can be slowed down and the symptoms can be managed. Hence, it would be best if you can start treatment in the very initial stages. While oxygen cannot stop or slow down the process of degeneration of lung tissue, oxygen therapy is often suggested to the patients to help them breathe easy, sleep better and save other organs from oxygen deprivation. However, it is suggested when you have an advanced degree of breathing difficulty. You may require to breathe through an oxygen pipe during exercise, during sleeping or even throughout the day. Medicines may be given by the doctor to control the symptoms of pulmonary fibrosis. What kind of medicine will suit you will depend on the severity of the condition. If there is an underlying condition which is spreading its effects to the lining of the lungs, like GERD, treating that condition may ease your discomfort and slow down the degeneration in the lung tissues. As a last resort, if you are unable to breathe without medical assistance and the condition still shows degeneration, you may have to sign up for lung transplantation. Although it is a major surgery with a considerable amount of risks when performed by a team of expert surgeons and doctors, successful transplantation can give you a new lease of life. Pulmonary rehabilitation is a rehabilitation program where the coordinator can guide you on how to live better with pulmonary fibrosis. You will get to know how to eat and drink better, how to exercise, how to do breathing exercises to make it easier to breathe when to call a doctor and many more things. Therapists can even help you to quit smoking if you are finding it difficult to do so. You can socialise with co-survivors of pulmonary fibrosis to know how they go about their day to day life. 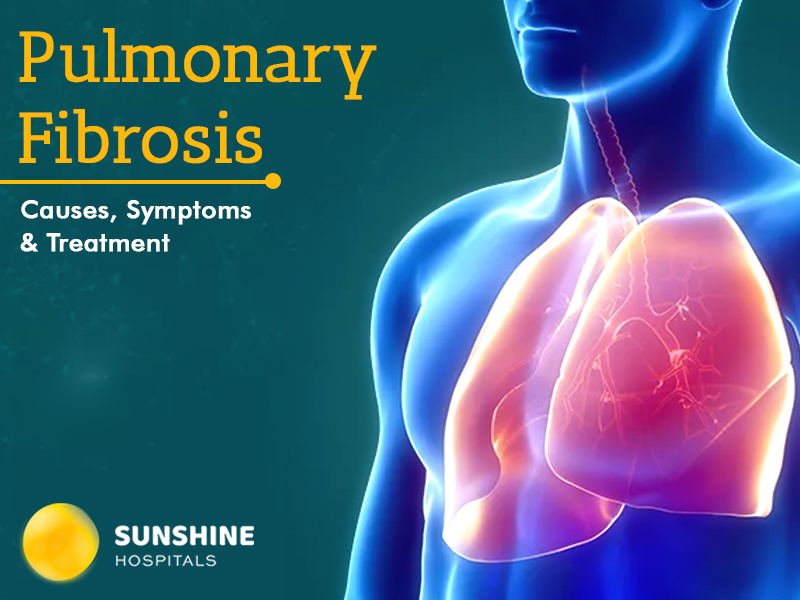 At Sunshine Hospitals, we provide complete, end-to-end care for all patients suffering from pulmonary fibrosis. You can book an appointment with us to get a guide on how to manage your lung condition to breath easier and thus, live a better life. Dr J. Raghunath Reddy, Consulting Pulmonologist at Sunshine Hospitals has been a revered practitioner in the field. His vast experiences in many other sections such as Critical Care & Sleep, Emergency and General Medicine has helped the hospital dealing with some complex cases before. He is trained in interventions like Bronchoscopy, Thoracoscopy, EBUS (Endobronchial Ultrasound) and Rigid Bronchoscopy. Overall Dr J.Raghunath Reddy offers a wide range of expertise and treatment solutions in Pulmonology.